The Hollywood Chamber of Commerce will honor singer and actress Mary J. Blige with the 2,626th star on the Hollywood Walk of Fame on Thursday, January 11, 2018 at 11:30 a.m. PST. The star will be dedicated in the category of Recording at 6201 Hollywood Boulevard in front of Eastown. “Mary J. Blige is one of the most popular singers of our generation. 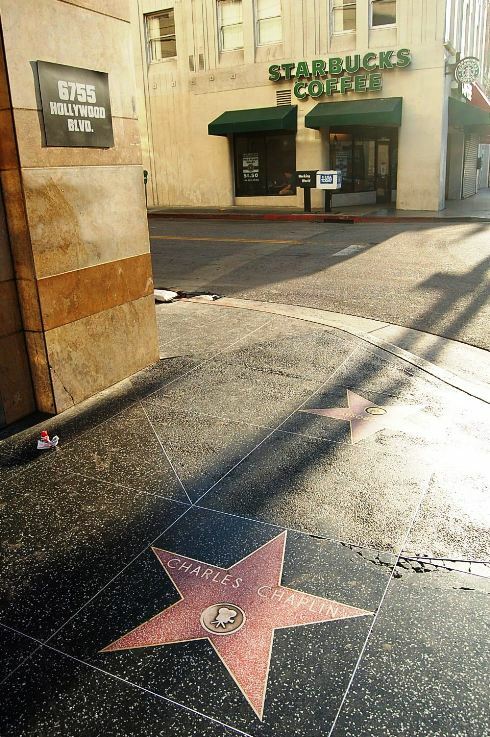 Fans will be thrilled to see her star on the Boulevard as her career milestones are celebrated on this very famous sidewalk,” stated Ana Martinez, Producer of the Walk of Fame ceremonies. Helping Emcee and Hollywood Chamber President/CEO Leron Gubler to unveil the star will be guest speaker Sean “Diddy” Combs. The iconic Grammy® Award-winning and Golden Globe nominated singer, songwriter, actress and philanthropist, Mary J. Blige is a figure of inspiration, transformation and empowerment making her one of the defining voices of the contemporary music era. With a track record in the music realm of eight multi-platinum albums, nine Grammy® Awards (with a staggering 32 nominations) and worldwide sales of more than 50-million albums. Blige ventured into acting where she has already received nominations for a 2018 Golden Globe, a 2018 SAG Award and a 2018 Critic’s Choice Award all for Best Supporting Actress recognizing her work in the Netflix film “Mudbound” opposite Carey Mulligan and Garrett Hedlund. The film premiered to rave reviews last year at Sundance and is now available to stream on Netflix. Born in the Bronx, New York, Blige began moving people with her soulful voice when at 18 she signed with Uptown Records in 1989, becoming the MCA-distributed label’s youngest and first female artist. Influenced at an early age by the music of Aretha Franklin, Chaka Khan and Gladys Knight, Blige brought her own gritty, urban-rooted style—fusing hip-hop, soul and honest, frank lyrics—to the forefront on her 1992 debut album What’s the 411? The multi-platinum set, executive produced by Sean “Diddy” Combs, quickly spun off several hits, including two R&B No. 1s: You Remind Me and Real Love. Blige helped redefine R&B and began forging a unique niche for herself on the more personal second album, 1994’s My Life. Blige is an artist who uses her gift of song to lift spirits and touch lives while bringing her heart, soul and truth to those who are willing to listen. She is loved for her passionate, chart-topping hits like “Be Without You”, “No More Drama” and “Family Affair” all of which have made her a force in music. And so began the Blige movement: connecting legions of fans who identify with and have accompanied her throughout her personal travails and growth—all fearlessly related through her music. Each subsequent album reads like a chapter from an autobiography: Share My World (1997), Mary (1999), No More Drama (2001), Love & Life (2003), the multiple Grammy-winning and hit-spewing The Breakthrough (2005), Growing Pains (2007) and Stronger with Each Tear (2009). Along the way, she’s lined up a string of hit singles, including Not Gon’ Cry, Love Is All We Need, Seven Days, All That I Can Say, Family Affair and Just Fine. In October 2013, Blige for Matriarch Records/Verve Records/Interscope Records released her first-ever holiday album titled, A Mary Christmas in collaboration with legendary producer, David Foster. The holiday album features Blige’s soulful interpretation of such classic holiday tunes as Have Yourself A Merry Little Christmas, and The Christmas Song. Blige is joined by several A-list guests such as Barbra Streisand, and performs duets with Jessie J, The Clark Sisters and includes a Spanish language collaboration with Mark Anthony. Blige, who co-penned I Can See in Color for 2009’s “Precious” soundtrack, has branched out into acting. She appeared in Tyler Perry’s dramatic comedy, “I Can Do Bad All By Myself” in 2009 and starred in “Rock Of Ages,” alongside Tom Cruise, Alec Baldwin and Russell Brand in 2012. Taking on a more dramatic role, in 2013, she starred as Betty Shabazz in the TV movie “Betty & Coretta,” a biographical story about the widows of Malcom X and Martin Luther King Jr. 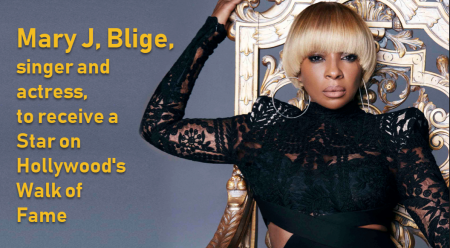 In November 2013, Blige starred as the mysterious guardian angel Platinum Fro in the holiday musical film drama “Black Nativity.” Ramping up her acting career, Blige has guest-starred on the ABC’s Black-Ish and How to Get Away with Murder, the FOX musical drama Empire and was seen playing Evillene, the Wicked Witch of the West, on the NBC musical, The Wiz Live! In 2014, Blige released her 13th studio album, The London Sessions, which reached the No.1 position on the Top R&B Albums chart and included a behind-the-scene documentary of her recording sessions that premiered at the Tribeca Film Festival 2015. Earlier in 2017 Blige completed The King and Queen of Hearts World Tour with Maxwell, and released her 14th album titled Strength of a Woman. Her first single off the album, “Thick of It,” held the No. 1 spot on the Urban AC Chart for 16 consecutive weeks after its release. 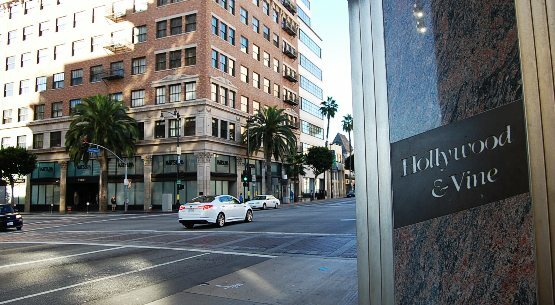 The Hollywood Chamber of Commerce will honor actress Gillian Anderson with the 2,625th star on the Hollywood Walk of Fame on January 8, 2018 at 11:30 a.m. PST. 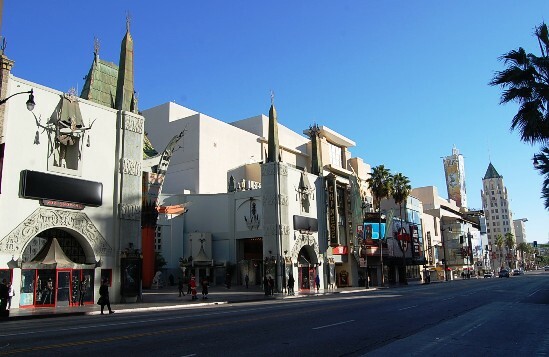 The star will be dedicated in the category of Television at 6508 Hollywood Boulevard next to the FOX Theatre. 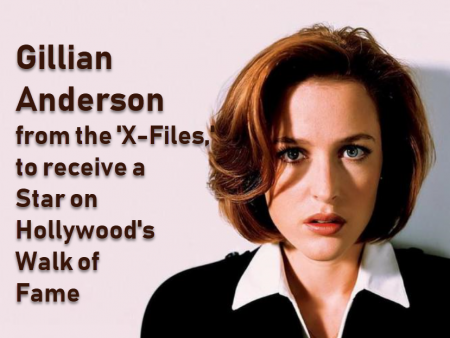 Award-winning film, television and theatre actress Gillian Anderson achieved international recognition for her role as ‘Special Agent Dana Scully’ on the American TV series “The X-Files.” Running for nine seasons from 1993-2002. Anderson won an Emmy, a Golden Globe and two Screen Actors’ Guild awards for the series. 2018 marks the 25th anniversary of the popular show and Season 11 premieres on FOX on January 3rd, with the second episode airing on January 10th at 8 p.m.
On stage, Anderson has been nominated for two Olivier Awards; one of which was her recent performance of “Blanche Dubois” in the Young Vic Theatre’s production of Tennessee “A Street Car Named Desire.” She won the Evening Standard Award for this performance. In Spring 2016, the production then relocated to New York’s St Anne’s Warehouse. The start of 2016 saw Anderson appear in the hotly-anticipated international return of “The X-Files” and the BBC’s hugely successful adaptation of “War and Peace.” Currently, Anderson can be seen in the Starz series “American Gods,” based on the popular novel by Neil Gaiman. On the series, Anderson portrays the role of “Media” and received critical-acclaim for her diverse transformations portraying the likenesses of David Bowie, Marilyn Monroe, and Lucile Ball, and many others. In addition, she will next be seen portraying ‘Lady Edwina Mountbatten’ in Gurinder Chadha’s “Viceroy’s House,” which premiered at the Berlin Film Festival in 2017, as well as Gilles Paquet-Brenner’s 2018 film “Crooked House” alongside Christina Hendricks and Glenn Close. Anderson has also wrapped production on Ryan Eslinger’s independent feature “UFO” with Ella Purnell, Alex Sharp and David Strathairn, and the action-comedy “The Spy Who Dumped Me” opposite Kate McKinnon, Mila Kunis and Justin Theroux. Anderson is also an author. “The Sound of Seas,” the third novel in her science fiction “Earthend Saga,” was published by Simon & Schuster in September 2016. Anderson co-writes the thriller series with New York Times best-selling author Jeff Rovin. Her most recent novel is non- fiction and co-written with journalist and activist Jennifer Nadel, entitled “We – A Manifesto for Women Everywhere.” It was released by HarperCollins and Simon & Schuster in March 2017 and made the London Sunday Times best seller list. Over the past 17 years, Anderson has been strongly involved in many charity organizations: as a board member of Artists For A New South Africa, a spokesperson for Neurofibromatosis Inc., a founding member of South African Youth Education for Sustainability (SA-YES), an ambassador for Survival International and a patron of the Alinyiikira Junior School in Uganda, among many others. She remains vocal about child and human trafficking, adult and child literacy, and the impact of commercial fishing on deep sea life. (Huffington Post) From his humble beginnings as a boy genius teen doctor to his Smurftastic summer hit and womanizing “How I Met Your Mother Ways,” Neil Patrick Harris has been a Hollywood staple for over two decades. A host of both the Tonys and Emmys, it was only appropriate that he was finally awarded one of show business’s highest honors. 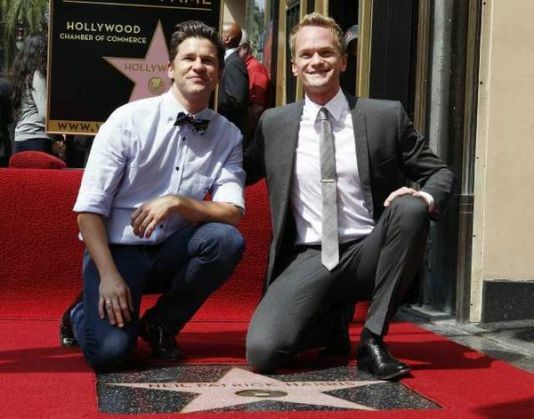 Today, Neil Patrick Harris became an official Hollywood star in front of the Pantages Theatre. The actor, joined by partner David Burtka and “Mother” co-star Jason Segel, received his official star on Hollywood’s Walk of Fame, where he joined the industry’s greatest luminaries and tweeted a photo of his star after the ceremony. This year marks the 5oth anniversary of the Hollywood Walk of Fame. 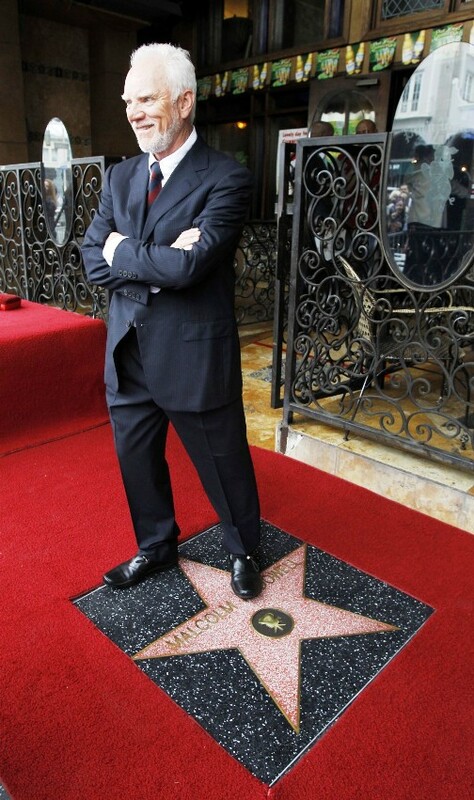 The idea for the Walk of Fame, which is world famous, goes back to 1953 when E. M. Stuart, who served as the volunteer president of the Hollywood Chamber of Commerce proposed the idea. Stuart described the Walk as a means to “maintain the glory of a community whose name means glamour and excitement in the four corners of the world.” A committee was appointed to begin fleshing out the idea. In 1960, 1,550 honorees were selected by committees representing the four branches of the entertainment industry at that time, and were laid out on the sidewalks of Hollywood Boulevard and two blocks of Vine Street – everyone that is, except for comedian Charlie Chaplin. Chaplin’s name was in the original list nominated for inclusion in the walk back in 1956, but Hollywood property owners objected to Chaplin, charging his moral and leftwing leanings tended to discredit him and the entertainment industry. His star was not included. In 1952 Chaplin had left Hollywood on a visit to England and while aboard ship in the Atlantic, was notified that his reentry permit had been revoked. Atty. Gen. James P. McGranery said the action had been prompted by “public charges” associating Chaplin with communism and “grave moral charges.” The comedian would have to appear at a hearing to prove his “moral worth” before he could return. Chaplin, who was still a British subject, declined to go through such a hearing. 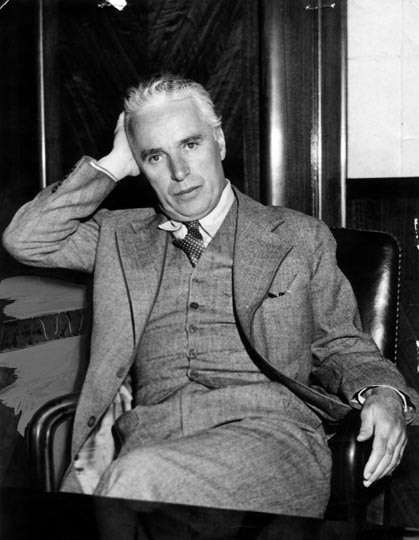 “Since the end of the last world war,” Chaplin said, “I have been the object of lies and propaganda by powerful reactionary groups who, by their influence and by the aid of America’s yellow press, have created an unhealthy atmosphere in which liberal-minded individuals can be singled out and persecuted. Under these conditions I find it virtually impossible to continue my motion-picture work, and I have therefore given up my residence in the United States.” Chaplin and his family moved to a mansion overlooking Lake Geneva near the Swiss village of Vevey. In August 1960, a superior court judge refused to issue an order compelling the Hollywood Chamber of Commerce and the Hollywood Improvement Association to show cause why they should not be directed to include Chaplin’s name on the Walk of Fame. 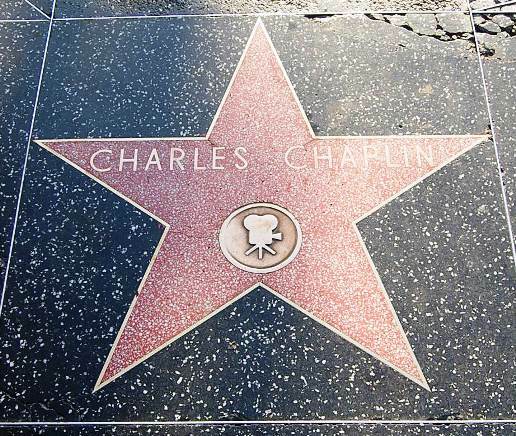 The court acted on a petition filed by Charles Chaplin, Jr., who contended that omission of his father’s name from the Hollywood Boulevard sidewalk project was malicious. Chaplin Jr. himself demanded $400,000 damages on the complaint that the decision of the two Hollywood organizations libeled him and injured his career. His suit was eventually dismissed. By the early days of 1972, the officials, including an attorney general of the United States, who were outraged at Chaplin’s radically-tinged politics, were now gone. 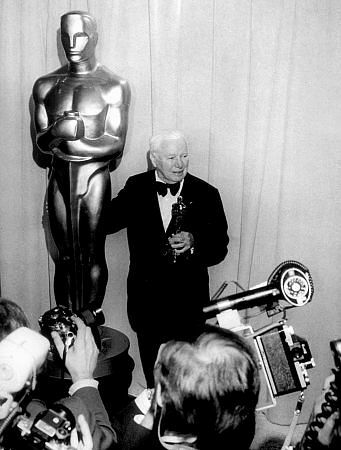 It was rumored that Chaplin would return to the United States for the first time in twenty years to receive a special Academy Award voted to him. If Chaplin decided to return, he would have to apply to the U.S. Consulate in Geneva for an immigrant or nonimmigrant visa. The U.S. State Department would then rule on the application. Possibly because of Chaplin’s promising return, the Hollywood Chamber of Commerce’s Executive Committee voted on whether to approve a star for the actor and voted 5 to 4 against it. After that vote, Chamber president, A. Ronald Button ordered an advisory poll of chamber membership that responded 3 to 1 in favor of installing a Chaplin star. Based on that, the Chambers directors went against their Executive Committees recommendation and voted 30 to 3 in favor of adding Chaplin’s name to the sidewalk honor. The decision still had to be approved by the Los Angeles City Council, but Button said it had always approved the directors’ recommendations in the past. “I can’t imagine them opposing the star,” he said. Eventually the city council approved Chaplin’s star, 11 to 3. The three dissenting councilmen never spoke publicly in opposition, but privately complained that since the comedian earned his money here he should not have left the country to live in Switzerland. At the time there were eighty names previously approved that had not yet been inserted because the funds were not available. This was before the days when a star had to be paid for by fans. 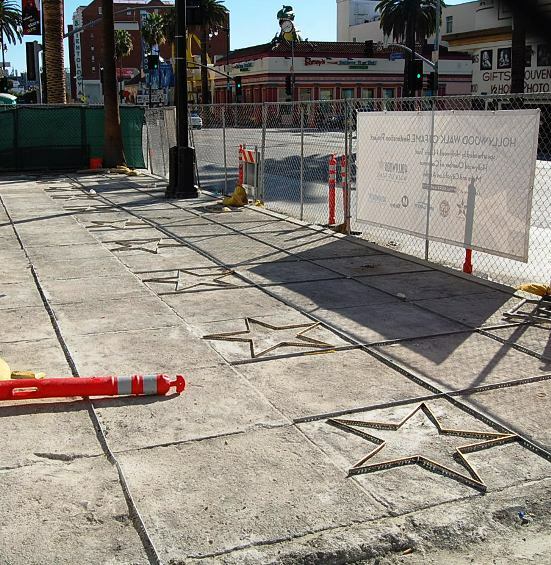 Instead each star’s installation was funded by the Chamber which, at the time, cost between $900 and $1,000. However, one unnamed board member offered to pay for the installation of Chaplin’s star. At that time it was not known where or when the installation would take place. Soon it was announced that after an exile of two decades, Chaplin would return to the United States and be honored with a special award from the Academy of Motion Picture Arts and Sciences. Before leaving Switzerland for New York, Chaplin received anonymous death threats, most by telephone saying they were going to kill him. “He expected to be shot over here,” said William Jordan, whose private detective firm was hired by the Academy to guard Chaplin during his four-day visit to Los Angeles. “That was his line. He said, ‘They killed Mr. Kennedy.’ I can’t give you the exact number but there were at least a dozen. 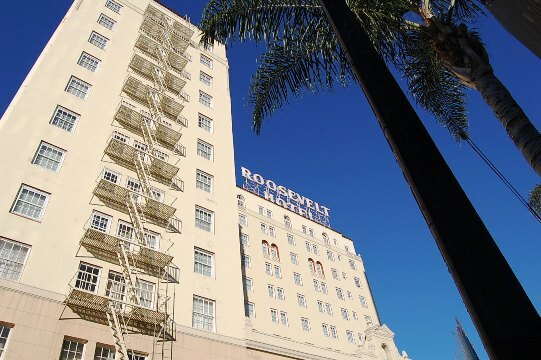 They were coming into the Music Center – site of the Oscar presentation – and they called his hotel.” Sometimes they specified they were going to blow him up or shoot him. Sometimes they didn’t specify how it would be done. 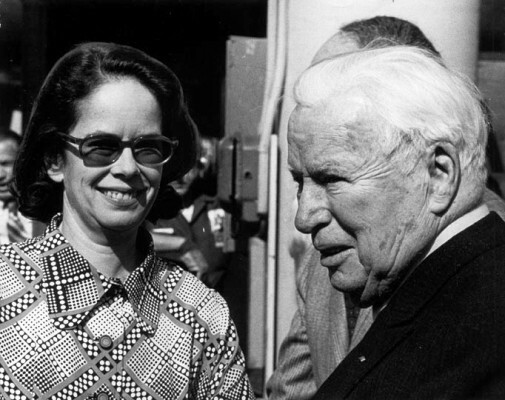 On April 7, 1972, the 82 year-old Chaplin and his wife Oona arrived at Los Angeles International Airport. Photographers, cameramen and reporters lined a walkway that extended from the plane to a waiting car. Finally, after a quick flurry of activity, Chaplin appeared at the top of the terminal stairs. He was short, almost portly. His white hair was wispy in the breeze. As he reached the base of the stairs he looked up and smiled at the row of waiting reporters. There were no cheers, no applause. He waved, and his words were barely audible. “How does it feel to be back, Mr. Chaplin?” a reporter asked. “Very strange,” was his reply. Only two representatives from Hollywood awaited him at the end of the walkway – Daniel Taradash, president of the Academy and Howard W. Koch, a member of the board of governors and the Academy’s treasurer. “This is the happiest moment in the history of Hollywood,” Taradash told Chaplin. The comedian, perhaps unable to hear amidst the commotion, shook his hand but reportedly said nothing. Chaplin was taken to the Beverly Hills Hotel, passing Metro-Goldwyn-Mayer studios in Culver City and 20th Century-Fox en route. His car did not stop or slow down. Chaplin made no public appearances, interviews or tours while he was in Los Angeles and turned down many of the private invitations he received. The following Monday morning, fans and several armed guards, gathered at the northwest corner of Hollywood Boulevard and McCadden Place as the Hollywood Chamber of Commerce officials uttered words of benediction over Chaplin’s star. Chaplin’s 12 year-old granddaughter, Susan Maree Chaplin, unveiled the star in her famous grandfather’s absence. The dedication ceremony was attended by many Hollywood oddities including “Alice of Hollyweird,” with her singing dogs; Albert Ciremele, a Chaplin impersonator, and “Aunt Pollu,” sweeping up the street with a gold-speckled mop. Also attending were several Keystone Cops, only one of whom, Eddie LeVeque, was an original. In the crowd were several old, white-haired women passing out a sheet of paper purporting to show “Charlie Chaplin’s Red Record.” To anyone who would listen, they would rail on about Chaplin’s political philosophy. Singer and newly minted leading lady Christina Aguilera got her star on the Hollywood Walk of Fame on Monday, just hours before hitting the premiere of her first film, “Burlesque,” at Grauman’s Chinese Theater. Star No. 2,423 — in the recording category and in front of the Hard Rock Cafe on Hollywood Boulevard — belongs to the five-time Grammy winner, who has sold more than 30 million albums worldwide and has four No. 1 songs to her name. Mom Shelley Kearns and brother Michael Kearns were there for the ceremony and posed for pics. LOS ANGELES, Oct. 28 (Xinhua) — The Hollywood Chamber of Commerce buried a time capsule full of articles representing the Walk of Fame on Thursday, in the culmination of the year-long celebration for the 50th founding anniversary of the landmark. The contents consist of items representing the five categories on the Walk of Fame. They include: “Wicked” and “The Lion King” play bills from the Pantages Theater and a history book about the famous theater, for the Live Theater category; a replica Capitol Records tower and letter for the recording category; a flash drive with radio show of the past and present from the Southern California Broadcasters and a Hollywood themed radio show from KLOS radio personality and Walk of Famer Jim Ladd for the radio category; DVDs of the Oscar telecasts from 50 years ago and 2010 for motion pictures; and for television, a 2010 Primetime Emmy Program, Emmy invitation, Emmy ticket and Emmy Governor’s Ball menu, according to a press release from the Hollywood Chamber of Commerce. “This will be a wonderful way to pass along our history and heritage to a new generation,” said Leron Gubler, Hollywood Chamber of Commerce President/CEO and emcee of the Hollywood Walk of Fame ceremonies. Other memorabilia placed in the 16x16x18-inch container are: messages from elected officials, a script from “Casablanca,” a special edition lipstick, an autographed photo of Joanne Woodward who was the first Walk of Famer, a piece of Elvis Presley’s star encased in Lucite from Johnny Grant’s collection, related DVDs, letters and other items. The time capsule was buried at the corner of Hollywood Boulevard and Highland Avenue, where the Walk of Fame originated in 1960. It will be opened in 2060 on the Walk of Fame’s 100th anniversary, according to the sponsor. Hollywood will celebrate the 50th anniversary of the Walk of Fame on Sunday with a party. The festival, which runs from 11 a.m. to 6 p.m., will include free movie screenings and performances and tours of area studios and theaters. 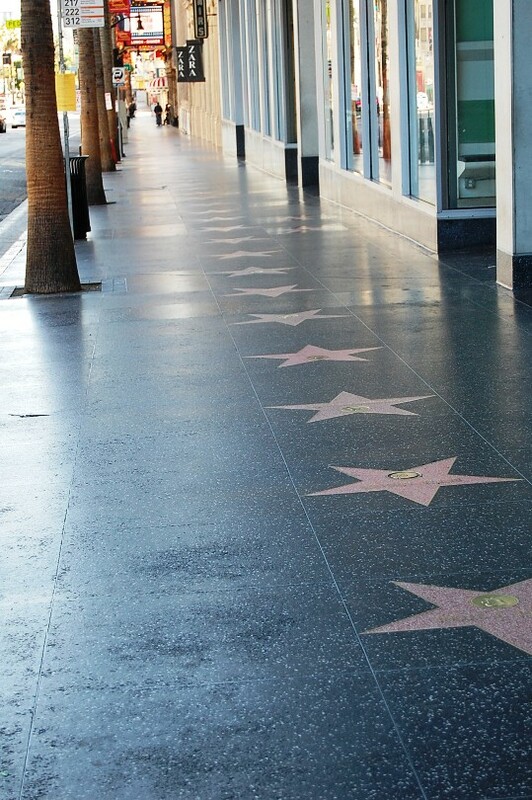 The Walk of Fame was conceived in the 1950s by business leaders in Hollywood as a way to beautify the historic core. The first star was set on March 28, 1960. 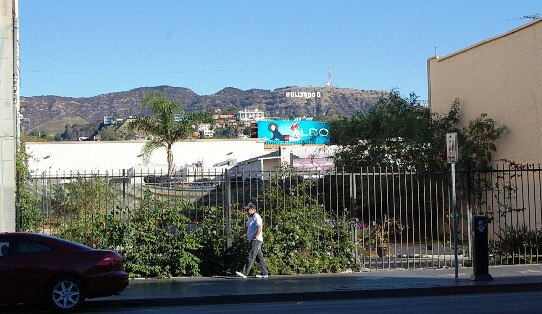 Since then, the attraction has proved a perennial draw for tourists eager for a taste of Hollywood. An estimated 10 million people visit the 18-block stretch each year. More information about Sunday’s festivities can be found on the Hollywood Chamber of Commerce website. And if you’re eager to know more about the 2,400 stars on the Walk of Fame, check out the L.A. Times’ Star Walk — a virtual tour that puts readers on the streets of Hollywood. John Peterson has kept the Hollywood emblems gleaming for 14 years. With 2,412 stars, that’s 110 a day and a full-time job. If anyone can restore Hollywood’s luster, John Peterson figures it’s him. The one-legged man has spent 14 years polishing celebrities’ stars on the Hollywood Walk of Fame. With 2,412 of them along nearly three miles of sidewalk, it’s a full-time job. Once Daley’s star is gleaming, Peterson stows his bottle of Brasso metal polish and the paper towel into a plastic shopping bag. Hoisting himself up by his arms, he inches along on his knees to the next star, dragging the bag and his crutches along with him.